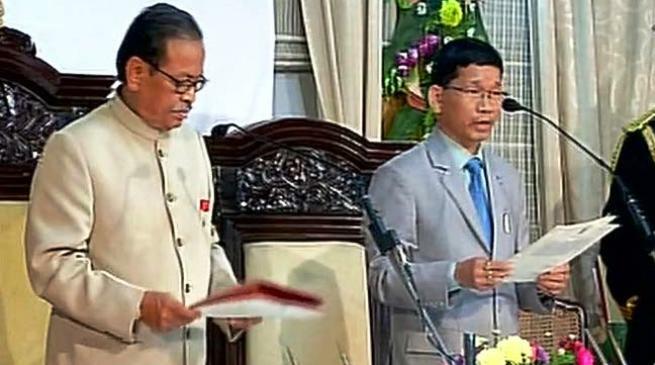 Former Congress leader Kalikho Pul has taken oath as new CM of Arunachal Pradesh , just hours after President’s Rule was lifted in the state this evening. The President’s Rule, which was introduced last month amid protests by the Congress, was revoked after a last ditch effort by Congress leader and deposed chief minister Nabam Tuki seeking an interim direction that his party be allowed to go for a floor test in the state Assembly to prove majority was rejected by the Supreme Court today. The Supreme Court had yesterday paved the way for a new government to be formed in the North Eastern state. The Union Cabinet had recommended the withdrawal of President’s rule in Arunachal Pradesh on Wednesday after Mr Pul, accompanied by 31 MLAs, including Congress rebels, BJP and independents met Governor JP Rajkhowa to stake claim to form a new government. A revolt by Congress dissidents led by Mr Pul led to a political crisis in the state that finally led to imposition of President’s rule on January 26. Mr Tuki reportedly has the support of 26 MLAs in the 60-member Assembly. The Congress, which had 47 MLAs in the 60-member assembly, suffered a jolt when 21 of its lawmakers revolted against Mr Tuki’s leadership. 11BJP legislators and two independents backed the rebels in the bid to upstage the government. Later, 14 rebel Congress legislators were disqualified by the Speaker. After the Centre’s recommendation for withdrawal of President’s Rule, the Congress moved to the Supreme Court and got an order for maintenance of status quo in the crisis-ridden state till it examined judicial and assembly records on disqualification of 14 rebel Congress legislators by former Speaker Nabam Rebia. However, yesterday, the top court virtually paved the way for government formation in Arunachal Pradesh by vacating its order on maintenance of status quo, after being satisfied with the Gauhati High Court order staying the disqualification of the 14 rebel Congress MLAs.